Efforts to hand out a complete, warm, fresh Thanksgiving feast continue this holiday as volunteers began cooking, carving, packing and delivering meals to anyone who needs it. But the numbers of those in need are rising, with an estimated 1,200 meals prepared this week through A Need We Feed, operating out of hub restaurants such as Chef Mike’s ABG and Caffe Italia. 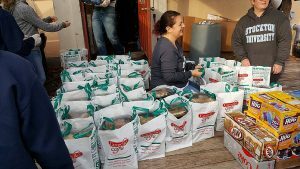 Christine Hernandez of Toms River, a board member for A Need We Feed, said that previously the requests were fewer than 800. The operation keeps growing, and donations and an army of volunteers are always appreciated. A Need We Feed is the recently formed nonprofit for grassroots efforts that were born in the aftermath of Superstorm Sandy. What began then through cooperative efforts has now become its own nonprofit this year. It grew further as efforts reached not just those with food insecurity but veterans or those who were isolated. “Essentially it is no questions asked,” said Hernandez. Anyone who needs a meal can put their name on the delivery list, though a Need We Feed also receives names from other agencies, nonprofits or groups of those who might need help. But volunteers are also connecting with area homeless, literally walking into encampments in the woods to deliver Thanksgiving, she said. Planning begins weeks in advance, as in the past area restaurants and eateries such as Bob’s Bagels on Hooper Avenue, Waypoint 622 in Brielle, Mulligan’s in Farmingdale and Capone’s in Toms River all lend their kitchens to the cause. Earlier this week the chefs at each restaurant cooked turkeys which were then carved. All the sides were prepped and cooking continued yesterday into today. On Thanksgiving all the meals are assembled and packaged for delivery and sent out to those in need, Hernandez explained. The operation uses about 20 volunteers at the restaurants cooking, then about 12 volunteers assembling everything. At least two runners are moving the packaged meals from the assembly line into delivery vehicles, and about 20 drivers help get the meals out to the community, she said. Thanksgiving morning, the efforts fire up around 6:30 a.m. The individually packed feast is turkey, stuffing, mashed potato, vegetables, dinner rolls, snacks, drinks (such as water, soda or juice) and even fresh baked pies from Harvest House. The packages even include forks and knives — “everything you need,” she said. The efforts are repeated all over again come Christmas, but with ham often the main course. A Need We Feed is looking to grow beyond the busy times of Thanksgiving and Christmas but also Easter meals, and has even forged partnerships to expand further to provide meals for school children in need. Hernandez said A Need We Feed has partnered with Big Brothers Big Sisters after school program operating at Hugh J. Boyd Elementary School in Seaside Heights to provide a meal during those hours. The organization also distributes to more than 100 families toys for the holidays. Upcoming fundraisers include a Casino Night on January 20 at Aqua Blu in Toms River. The efforts have come a long way since the inception after Sandy, Hernandez said. She said the interaction often means more than the food given. Hernandez described how one delivery to a veteran may have saved his life. “He told the delivery person he was depressed and was going to commit suicide and that time they spent turned things around that day.” Hernandez said A Need We Feed has partnered with the American Legion and the Mental Health Association of New Jersey to create linkages so the folks they deliver to might find other services they might need. Volunteers can help A Need We Feed by registering through the group’s website, here.